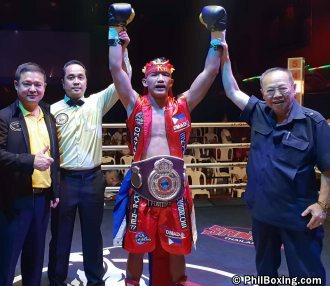 KJ Natuplag wins in Thailand on Sunday. BANGKOK, Thailand -- In the exciting international Highland boxing show "Born to Fight," Filipino KJ Natuplag, Chinese Zheng Li, Japanese Yuya Nakamura and Uzbeki Bekzod Tursunboev overpowered their respective opponents to score knock out wins Sunday evening (Sep 22) at Ram 100 Thai Boxing Stadium in Bangkok, Kingdom of Thailand. In an action combat, unbeaten Filipino 126-pounder KJ Natuplag (7-0-2, 6KO's) lost the first round, but came back strong in the following chapters, landing damaging straight rights and vicious left hooks on Thailand fighter Pongpasin Chulerd of Samut Prakan, dispatching the young tough Thai in a TKO win in round three. With the victory, the 21 year-old Natuplag of Lagawe in the province of Ifugao, captures the Asian featherweight strap of new boxing sanctioning body WBL (World Boxing League) based in Florida, USA. In another thrilling war, hard-hitting Chinese welterweight Zhen Li (4-0, 4 KO's) of Shenzhen proved to be too strong for the more experienced Afrizal Tamboresi of Padang Menang, Indonesia, rocking him down to the canvas, dismantling him in entertaining five chapters. Zhen Li (C) is the new ABF 147 pound champion. 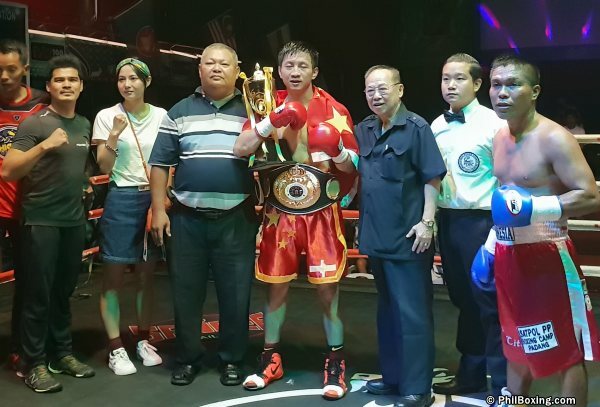 The win makes the friendly Chinese Zhen Li the new ABF (Asian Boxing Federation) 147 pound Champion; and ABF President Naris Singwancha of Thailand climbed to the top of the ring to belt the new titlists, who wore in his boxing trunks the bright red and yellow colors of the Chinese National Flag. The Chinese fighter Zhen Li is trained in Shenzhen by Filipino former WBA Superfly world titlist Drian Francisco. The fight's third man was Phanu Kusolwong and the supervisor for the ABF was the experienced Surapote Pongjivanich. Moreover, exciting Japanese bantamweight Yuya Nakamura (9-2, 7 KO's) of Yao, Osaka, came back from a knock down in the electrifying second round to overpower and knock out tough fighter Wichet Sengprakhon (8-5, 3 KO's) of Nakhon Ratchasima, Thailand. Yuya Nakamura (C) stops Wichet Sengprakon. The thrilling win puts the Nippon warrior Yuya Nakamura back into the winning column after a rough knockout lost last month here in Thailand. 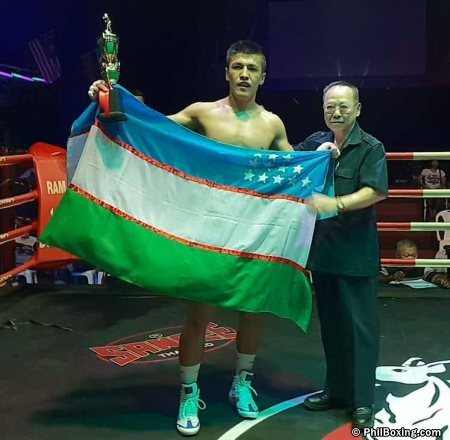 What's more, undefeated Uzbekistan southpaw Bekzod Tursunboev (3-0, 3 KO's) of the Vladimir Boxing Stable in Malaysia, ravaged the much younger Atthapon Baenkham of Thailand in the tough action of round 2. Bekzod Tursunboev of Uzbekhistan wins. The Uzbek came into the battle swinging hard with vicious straight lefts that fast reduced the stamina of the brave 16 year-old Thai (also a Muay Thai combatant), who landed some good punches on Tursunboev early on in the second stanza, though not enough powerful to stop the incoming fighting train made in Tashkent. Official time was 2:05 minutes in round two. 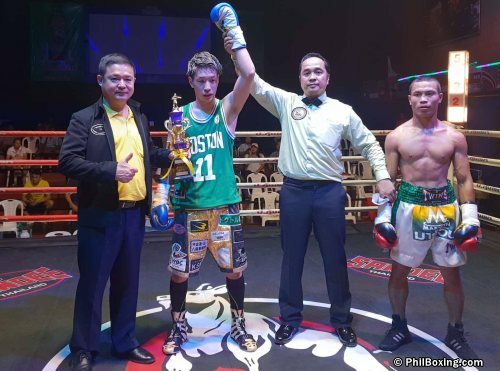 Plus, 14 year-old Thai super featherweight Phoobadin Yoohanngoh (3-0, 2 KO's) of the Singwancha boxing stable recorded the second knock out win of his young fighting career by vaporizing fellow Thai Kittisak Kamoncher in the third round of their warrying saga. Even at such an early age, Yoohanngoh displayed good boxing skills and power, disassembling his elder foe, brutalizing him mercilessly with high caliber blows to the head and mid-section. The referee was Bunsom Deejang. The official time of stoppage was 1:40 minutes in round 3. 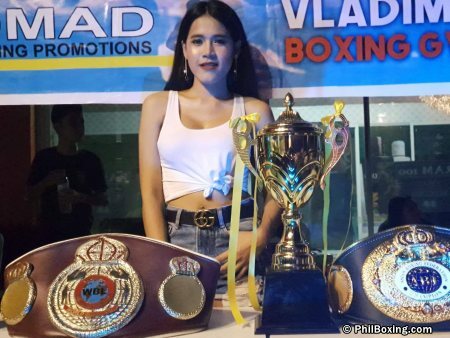 In women's boxing, Thai 105-pounder pro boxing fight girl Kanyarat Yoohanngoh (4-2, 2 KO's) battling out of the red corner exhibited superior boxing skills and good hands power to mark a four-round unanimous decision win over fellow Thai warrior Rungnapha Phangsin. And In more girl's boxing, cute Thai 122-pounder warrior Napaporn Ruengsuwan (2-1, 0 KO's)) of the Highland Boxing Team outpointed tough fighting lady Worawut Duankao. The taller Ruengsuwan made good use of her height and more refined boxing technique to dominate her strong coming-forward foe wearing blue. The event's producer was Filipino Brico Santig (head of Highland Boxing Team), in association with co-promoter Supanat Chanram of Thailand and DMAD Boxing Promotions. The card supervisor was Royal Thai Army Colonel Damrong Simakajornboon. Ringside doctor was Dr. Jirasak Bubpachart. The author Carlos Costa is a veteran Fight Reporter born in Panama, living in Cebu, Philippines. He attended this boxing show in Bangkok, Thailand. Carlos can be reached by email: Carloss512@hotmail.com and WhatsApp: +639184538152.